The West is attempting to isolate Russian President Vladimir Putin in the international arena and even topple him, while simultaneously demanding that he resolve the crisis in Ukraine, Putin’s spokesman said in an interview with a Russian newspaper. Currently in Western diplomacy, with reference to Ukraine“there is a substitution of concepts, which is leading to an escalation of the conflict” in the country, presidential spokesman Dmitry Peskov said in an interview with the chief editor of the “Argumenty I Fakty” (“Arguments and Facts”) weekly on Tuesday. “In the meantime, to put it simply, the West is trying to play Putin off as a party to the conflict, to isolate him in international politics, to strangle Russia economically in their own interests, to get him overthrown, while demanding that he resolves the crisis in the neighboring country,” he said. The conflict in Ukraine has “unmasked” the nature of international diplomacy, international relations and laws, he added. There is no chance Putin will be invited to the next meeting of G7 leaders, German Chancellor Angela Merkel told Frankfurter Allgemeine Zeitung newspaper in an interview published on Thursday. “The former G8 group has always viewed itself as a community of values,” she said. Peskov said that the Russian President is not expecting an invitation. According to Merkel “supposedly Putin does not fit into this system of values with his world view,” he remarked.“Is this the system, which, for example, allows the recognition of the results of a coup d’etat the next day [after it happened]? If so, Putin surely does not fit into such a system with his understanding that such a revolution can hardly be legal,” he said. However, Russia cannot resolve the conflict as it is an “inter-Ukrainian issue” and the dialogue can be “launched only by...[officials in] Kiev”, he added. “The attempt to solve the crisis using force is a dead end. Over 7,000 people have already died in the war. 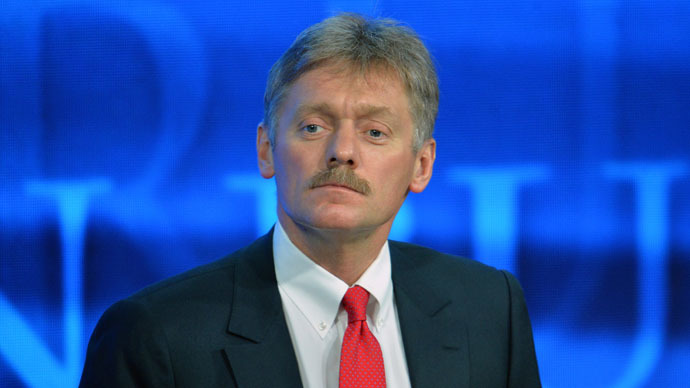 Until Kiev starts communicating with its regions, people will continue dying,” Peskov said. Ukrainian troops launched a massive assault on militia-held areas in eastern Ukraine after an order from Kiev on Sunday morning. The assault came despite Ukrainian President Petro Poroshenko receiving a proposal on Thursday night from Putin, suggesting that both sides of the conflict withdraw their heavy artillery in accordance with the Minsk agreements. On Tuesday Peskov expressed hope that the Minsk group will continue its efforts and discussions will bear fruit in order for talks in the so-called “Normandy format” to take place as planned in Astana, Kazakhstan. The Normandy Four platform – Ukraine, Russia, France and Germany – was created in June 2014 when the leaders discussed the Ukrainian crisis on the sidelines of the celebrations of the 70th anniversary of D-Day in Normandy, France.